So we had a day trip to visit our lovely friends, ED and ID. The idea was that S could mostly do arty things with ED, I could play some games with ID, and Miss B could join in whichever activity she fancied. Actually, Miss B had been thinking about what games she wanted to play for a few days (Dominion being top of that list) and helped me choose the pile to take along. We knew ED and ID have a decent selection themselves, but it doesn’t hurt to be prepared. Before lunch we had a couple of rounds of Goblins Drool, Fairies Rule, which is always a crowd pleaser and we are seriously looking forward to getting hold of the real cards when it is finally published properly. This was then followed up by a couple of hands of Sleeping Queens, which has been consistently one of Miss B’s favourite games since we got it. After a pasta break, the ladies went off to be creative while Miss B joined ID and I for a game of Dominion. We let Miss B choose the cards, which turned out to be a source of great challenge and opportunity. 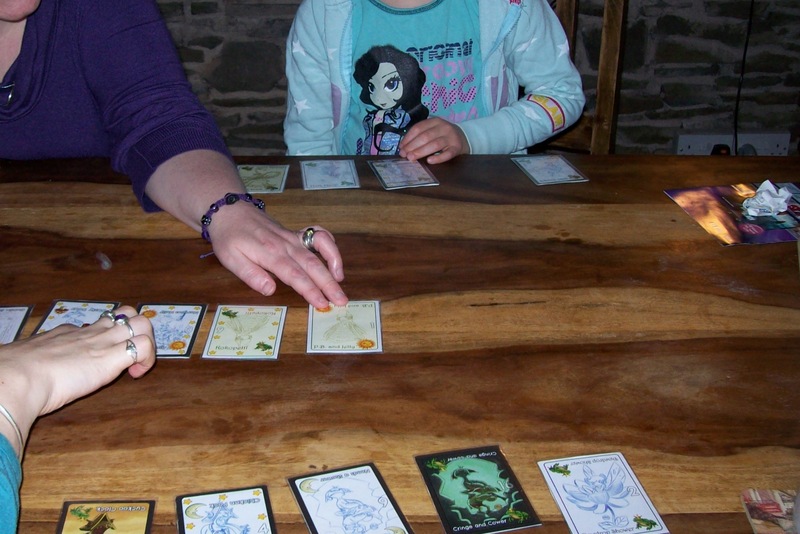 Miss B is rather into attack cards in Dominion and was soon repeatedly playing Witches (as were we others) which meant that the game steadily slowed down due to the sheer number of accumulated curses (and we didn’t have cards that would effectively clear them up in the game). In the end, we ended the game a little early as Miss B was getting a bit bored with the slow progress and wanted to do some painting. I’m not sure if I should ban Witches when playing Dominion with Miss B for the time being, or if I should just remind her of this experience next time and then let her decide. Of course, now I write that down it seems pretty obvious to me that the latter option is the right one. Anyway, after Dominion, Miss B moved on to the art area while I got to have a game of Infiltration with ID to round the afternoon off. By the end Miss B was showing quite a lot of interest in this, so maybe I’ll try playing that with her soon — though probably using a cooperative form of the game. Another great day, and many thanks are owed to our hosts. So I’ve been keeping this blog (on and off) for over a year now and we’ve played quite a lot of games. We’ve had only one report for most games, though a few have had extra mentions. The question now is which are the favoured games that we keep going back to? Now, all this is just me recording my hunches, but it’s probably safe to say those six games are a good selection that get plenty of play and will probably continue to do so for a while. But in the interest of science, I’m planning to be a bit more systematic for a while. My plan is to record what we play and who chooses it through the month of July. I’ll report back after doing that and see what that tells us. This afternoon Miss B and I hosted a little games afternoon. Four adult friends came around and we managed to play through quite a large selection of games, with Miss B making the choices (with me guiding as to suitability for the number of players we had). So, before anyone arrived, Miss B and I had some dice practice with a few rounds of Shut the Box. We have a fairly nice box for this that I found in a charity shop many years ago, and I only dug it out of the cupboard a few days ago and had forgotten the whole Zen of it. Plus it’s great adding practice for Miss B. Our first couple of friends arrived and we were pretty much straight into a game of Giro Galoppo which, unlike last time Miss B stuck with to the end, and took the jostling of the race extremely well. We then got through a few hands of Sleeping Queens before a quick single race game of Ave Caesar, a couple of rounds of Ghost Party and then getting out a real oldie that we hadn’t played for a long time, Tot Ten. By the time we were half way through Tot Ten, our other couple of guests turned up. so when we had finished, we moved on to a big game of Castle Panic. As it turned out we were very lucky with the run of the monsters, so the panic would have been better described as “mild concern”, but it was a remarkably fun little team exercise in which Miss B did very well suggesting cards to trade and behaving fantastically well. She definitely really thrives in cooperative games and seems to really enjoy being part of a team. Finally, we rounded off with a five-player game of Coloretto (report our earlier plays of this game coming up in the next couple of days I expect) which went well and left Miss B only two points short of the winning score after getting not much more advice from the adults than one or two “are you sure?” comments (which she pretty much ignored, so it shows what we know!). After a very tired little girl went to bed, I got to play Dominion with the two guests who stayed a little later, which was great. I really must work out a slight simplification of Dominion for Miss B to play — I think the big problem will mostly be in all the shuffling, to be honest. Any suggestions would be greatly appreciated. So, another fun day leaving me very proud of Miss B. When put in a situation with adult gamers she does extremely well. Okay, so she can take a long time over turns sometimes or get distracted, but I know plenty of adults like that (myself included sometimes). I do owe a big thankyou to our lovely friends K & R and V & K for coming along and being very patient. I must admit I was a little skeptical about Sleeping Queens, as it looked very much a kid’s game, but it had been recommended (thanks, Sam!) and I’d seen some positive comments online, so why not give it a go? This comes from the Gamewright stable (along with one of our favourites, Loot) and was, apparently, designed by a six-year-old girl (amusing when the box says it’s for ages 8+). Actually, the game smacks of having been built from a standard playing card deck (or two) and then enhanced with some extra cards later. So, you play kings to wake up queens and if you wake enough queens you win. Knights and potions can deprive an opponent of awake queens, but can be countered by dragons and magic wands respectively. Jesters have random effects and the rest of the deck is padded out by number cards which have no effect other than in helping with the randomness of the jesters. Except you can discard multiple number cards if you can make matching pairs or (and here is the educational bit) you can make 3 or more cards into an addition equation, for example, if you have a 2, a 3 and a 5 then 2+3=5, so you can discard them and draw replacement cards. This whole maths thing is pretty pointless but, at the stage Miss B is at, she absolutely loved it and got a real sense of achievement when she figured out a sum. The rest of the game was pretty enjoyable too, helped along by the pictures on the cards. Sleeping Queens is good, but for me it falls into the “definitely a kids’ game” category as I can’t see many adults choosing to play it in the absence of children (as they might for, say, Ghost Party). That said, I’m happy playing it occasionally and Miss B loves it, so I expect we’ll be playing this quite a lot. 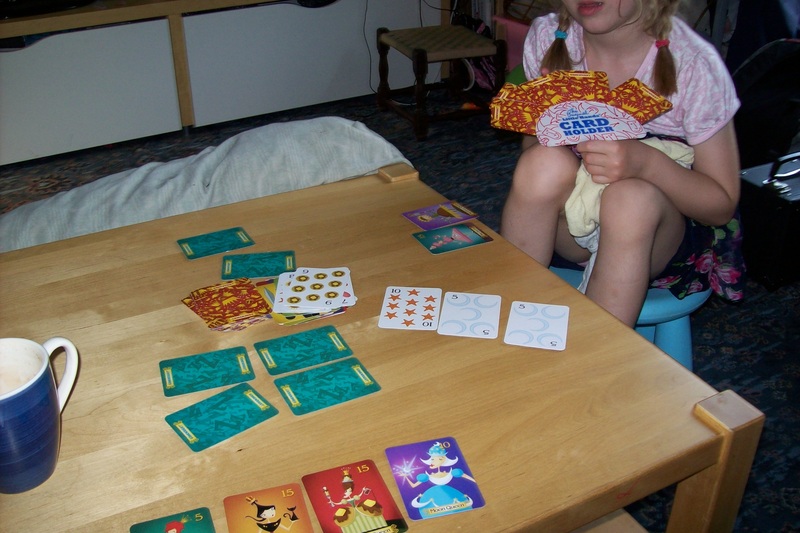 The game: Sleeping Queens (Gamewright), 2 to 5 players, aged 8+. I want the black horse… no, the brown one. If you move the moon backwards you can go back in time!